When it rains in 21 New Jersey cities and towns with combined sewer systems, raw sewage pours into rivers and backs up into basements and onto streets. This is known as a combined sewer overflow (CSO). An estimated 23 billion gallons of a mixture of raw sewage and stormwater are dumped annually into New Jersey’s waterways as a result of CSOs. In 2015, the New Jersey Department of Environmental Protection issued a permit that requires these communities to develop plans by 2020 to reduce sewage in nearby waterways. Implementing these plans will cost billions of dollars over the coming decades and will have significant effects on residents and business owners for generations to come. There is still an enormous need for public outreach, and the clock is ticking. Infrastructure determines the landscape of economic opportunities and creates the conditions for social and physical well being. 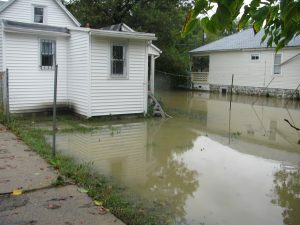 Localized flooding onto streets and into basements is disruptive to residents and businesses and can contain dangerous bacteria. Sewage overflows can lead to contamination of drinking water supplies. The 21 municipalities with combined sewer systems are affected by private sector disinvestment and a history of environmental contamination from industry. Environmental problems from industry and combined sewer overflows have had a disproportionate impact on low-income residents and communities of color. While there are robust public outreach efforts in some places, these efforts are not being made everywhere, leaving many people who work, live, and own businesses in these cities in the dark. The cost to upgrade these systems — the biggest infrastructure investment that some of these communities will make in a generation — will be paid for by residents and businesses. Most combined sewer systems are located in growing urban municipalities that are struggling to address multiple issues, from a history of industrial contamination and private sector disinvestment to the pressures of revitalization. 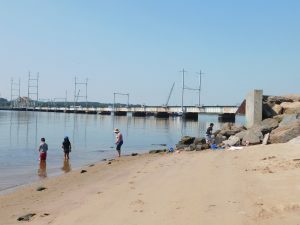 Access to waterways has been limited and beaches have been closed due to dangerous bacteria, likely caused by heavy rain that causes polluted runoff to flow into rivers and bays. Plans to reduce combined sewer overflows will be implemented over the coming decades, at the same time that these communities will need to address climate resiliency. Green solutions may not be evaluated based on other community and environmental benefits, like added green space, improved air quality and reducing the heat island effect. NJDEP issued new CSO permits as of July 1, 2015 to develop long term control plans. July 1, 2018 – System Characterization Report, Public Participation Process Report, Compliance Monitoring Program Report, Consideration of Sensitive Areas Plan. Review the reports here.